As most IT professionals will know, there is a significant difference between the capabilities of a consumer email filter and a corporate email filter. Although personal email security is no less important than corporate email security, the complexity of managing multiple mailboxes means a corporate email filter has to have greater functionality and more robust filtering mechanisms. Deciding which corporate email filter is best for your particular organization is no easy task. There are many different options that are evolving all the time in order to address the increasing sophistication of email spammers. For example, whereas sandboxing was once the “go-to” solution for blocking unknown threats, many businesses are now opting for email filtering solutions with a greylisting function. One of the most significant differences between a consumer email filter and a corporate email filter is the spam detection rate. In a recent test by the independent testing organization AV Comparatives, the average spam detection rate of the top ten consumer email filters was 96.86% – an acceptable level for an individual receiving ten or twelve emails per day, but not for an employee receiving upwards of one hundred emails per day. Using multiple filtering mechanisms and learning techniques such as Bayesian analysis, an average corporate email filter can detect in excess of 99% of spam email. However, this means an employee is still likely to receive one or two spam emails per day. In an environment with thousands of employees, the business is exposed to thousands of risks every day. It only takes one click on a malicious URL for a computer – and possibly a network – to be infected with malware or encrypted with ransomware. This is why greylisting is so important. When enabled, the function returns all incoming emails to their originating server asking for the email to be resent. Spammers´ servers are typically too busy sending new spam messages to respond to the request, and the spam is never returned. By including greylisting among its arsenal of filtering mechanisms, a corporate email filter can achieve spam detection rates in excess of 99.9% – significantly reducing a business´s exposure to risk. In addition to a high detection rate, a corporate email filter should also be capable of outbound scanning for spam and malware. This function can help identify corporate email accounts that have been compromised and infections within the network that have not yet been caught by antivirus software. Used as an early warning system, outbound email scanning can advise IT security teams of threats to the integrity of the network and prevent the business´s IP address being blacklisted. Email compromise is a particular concern to IT security teams. If a spammer has been able to gain control of an internal email account, he or she can use it to send spam to the business´s contacts and deploy Business Email Compromise attacks within the business. If the outbound spam mail is caught by the recipient´s corporate email filter, the business could have its IP address blacklisted – affecting not only its ability to communicate by email, but also access to its website. Some internal security issues can be unintentional. Say, for example, an employee uploads a file he or she has been working on at home on their malware-infected PC, or connects their malware-infected mobile device to the business´s WiFi network, the result could be the same without the network having been infiltrated by a cybercriminal. Outbound email scanning will catch these events and enable IT security teams to act on them quickly. SpamTitan is a corporate email filter that has been developed to address the issues faced by large businesses. 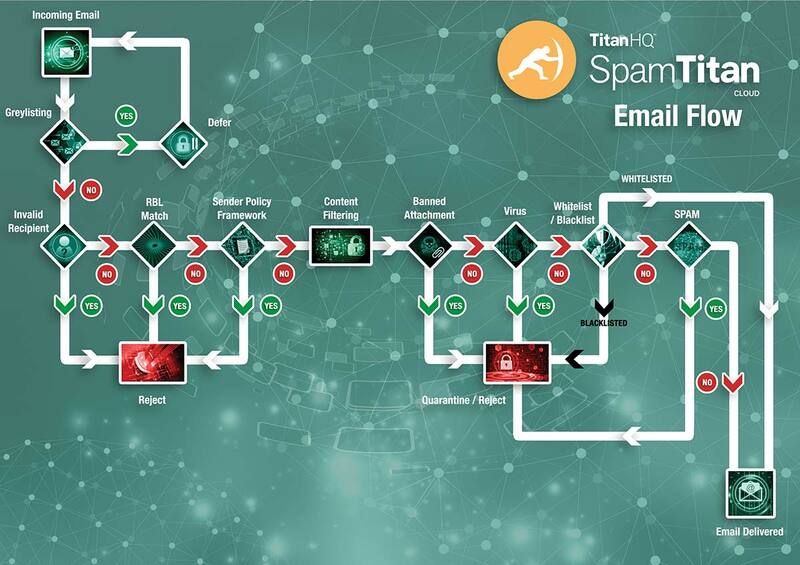 With greylisting and outbound scanning among its many features, SpamTitan achieves spam detection rates of 99.97% to better protect business network´s from phishing, malware and ransomware. SpamTitan has also been developed to be easy to use, with administrators managing our corporate email filter from a centralized, web-based administrative portal. SpamTitan is available as a Gateway virtual appliance or as a cloud-based anti-spam service. It is compatible with every operating system, has unlimited scalability, and all updates are conducted remotely to minimize the maintenance overhead. Administrators also have a suite of customizable reports at the fingertips in order to review historic email data, identify threats and investigate their source. Despite SpamTitan´s effectiveness at blocking spam and other feature-rich capabilities, subscriptions to our corporate email filter typically cost less than $10.00 per year depending on the number of mailboxes that need protecting, the deployment option and the payment cycle. However, before deciding on whether SpamTitan is an appropriate solution for your requirements, we invite you to take advantage of a free trial to evaluate SpamTitan´s effectiveness in your own environment. The free trial gives administrators the opportunity to enable and disable various functions in order to assess how each affects network security. Acceptable spam thresholds can be applied for each user, user-group or domain, and adjusted as necessary to account for individual requirements. Naturally our customer and technical support departments are available throughout the trial to help you find the optimal settings for your corporate email filter and, at the end of the trial, no further configuration of the filter should be necessary if you choose to continue using our service. For further details of this opportunity, or to find out more about SpamTitan´s corporate email filter, do not hesitate to contact us today. Most standard email filters fail to achieve acceptable spam detection rates. By comparison, SpamTitan has a verifiable spam detection rate of 99.97%. Despite a rich selection of features, SpamTitan is exceptionally easy to manage. Speak with us today to find out more, or click “Start Free Trial” to reduce spam in 15 minutes.